Rats are thought to have originated in Asia and to have spread across the word through the shipping trade. In Britain, they were viewed with suspicion and were widely thought to have carried the bubonic plague, which killed hundreds of thousands of people in several outbreaks the 17th century. Life was tough for the majority of people in 19th century Britain. Living and working conditions were poor and environment-borne infectious diseases like cholera were widespread. Standards of hygiene were minimal and rats lived alongside people in dilapidated houses. 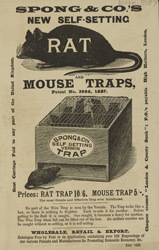 Rat and mouse traps like the one featured on this advertisement were common in 19th century houses.